Classroom Licence for 35 Users. Explore the vibrant 3D world of Variant: Limits as Equa uncovers the secrets of the mysterious Manthan civilization. Master continuity, functions, limits, and asymptotes to unlock the power of the Manthan technology and save the planet from destruction. 'Variant: Limits' aims to promote conceptual understanding through direct interaction and immediate feedback in the game environment. Finite Limits: Introduction to limits, one-sided limits, and limits of combined functions. Continuity: Limit definition of continuity at a point, continuity of combined functions, and the intermediate value theorem. Infinite Limits: Horizontal and vertical asymptotes. Students manipulate objects within the 3D world using calculus principles and theories. Players are immersed in an environment that includes an engaging narrative, hidden backstory, and a high-stakes adventure. Intuitive feedback and game interaction allow players to play and explore at their own pace. Intelligent game analytics allow instructors to monitor student activity and provide insight into student progress. 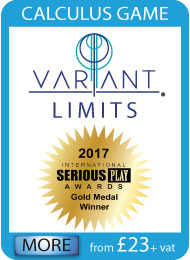 It won the "2017 Serious Play Awards" Gold Medal. One student commented "Great game! Really loved it and hopefully it can be used in classes! It's really engaging!" Enter your friend's email address. Enter a message to include with the product information.